Before talking about Mockito Framework. Let’s see why do we need it at the first place and how it can be helpful. Last year, I was working on one project which talks to other third party services as well as with the database connection and to test the functionality of my application, third party application should be up and running. There can be a chance where all these services might not available during unit testing. At such situation, mocking becomes a natural solution for unit testing. Using Mockito, you don’t really need a database connection. You just need a mock object that returns the expected result. Mockito is a mocking framework, the JAVA-based library that is used for effective unit testing of JAVA applications. It lets you write beautiful tests with a clean & simple API and used to mock interfaces so that a dummy functionality can be added to a mock interface that can be used in unit testing like we don’t require a database connection or properties file read or file server read to test a functionality. A mock object returns a dummy data corresponding to some dummy input passed to it. It facilitates creating mock objects seamlessly and uses Java Reflection in order to create mock objects for a given interface. Mock objects are nothing but the proxy for actual implementations. You can download the JAR file and place it in your project class or If you are using Maven, then you need to add its dependency in the pom.xml file, as shown below. 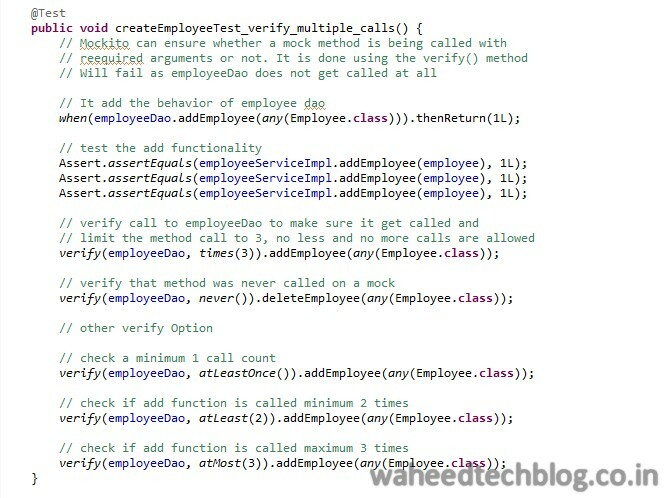 Mockito provides various Annotation/Class/Function using which we can integrate mock object into out JUNIT test cases. I’ve uploaded one tutorial on GITHUB which we will refer it to here to understand the behavior/implementation of Mockito framework. 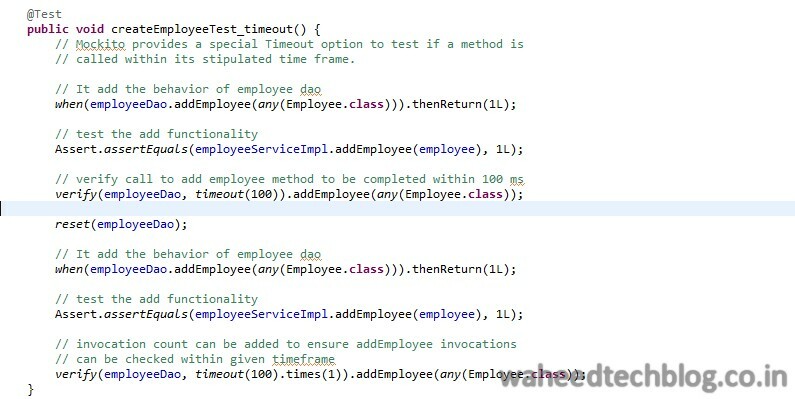 In EmployeeServiceTest_Annotation Class, I am invoking employeeServiceImpl.addEmployee(employee) to add the employee object and expecting long Id after the creation of object into the database. This API internally call employeeDao object to persist the data into the database and get the results. Over here, employeeServiceImpl is the class in which we will inject the employeeDao mock object. Mockito supports the creation of mock objects using the static mock() method or using @Mock annotation and to use this annotation, we must invoke the static method MockitoAnnotations.initMocks(this) or use @RunWith(MockitoJUnitRunner.class) to populate the annotated fields. @InjectMocks: it is used to create and inject the mock object. Mockito provides when(… .).thenReturn(… .) method to configure which values should be returned at a method call based on specific condition. It will return a value once it matches with a condition. It will return 1 whenever we invoke addEmployee(…) with any Employee object. If you specify more than one value, then it will return in the order of specification until the last one is used. Mockito provides another method called verify() which is similar to When() but does not check the result of a method but it checks that a method is called with the right parameters. 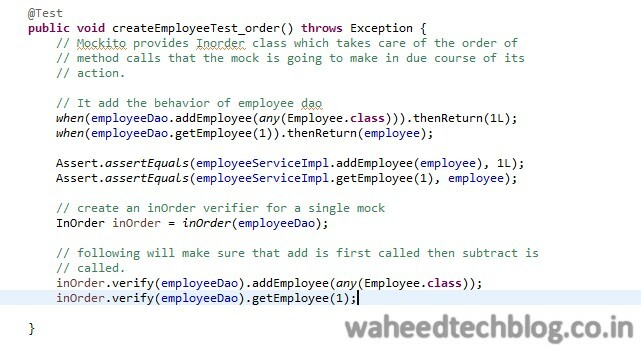 Mockito provides the capability to a mock to throw exceptions so exception handling can be tested. Mockito provides Inorder class which takes care of the order of method calls that the mock is going to make in due course of its action. // following will make sure that add is first called then subtract is called. Mockito provides an option to create spy on real objects. When a spy is called, then the actual method of the real object is called. 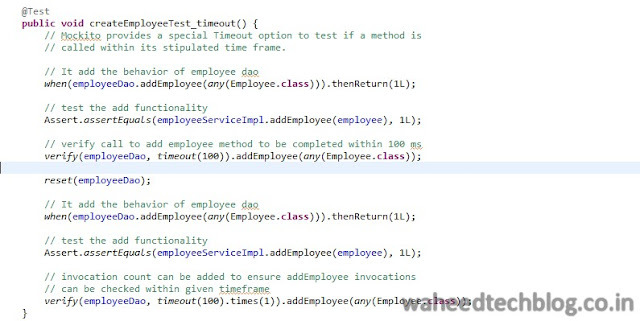 Mockito provides a special Timeout option to test if a method is called within its stipulated time frame.